When you first arrive to Kelowna you quickly discover there are two types of seniors. There are the ones my age closer to 60 than 90 and there are 80+ like my mother. When you are here to help out your mother you start to realize just how important a distinction this is. The picture here is my mother and her husband John. Both had enjoyed long marriages prior to meeting each. Both lost their spouses to cancer. Mom had been married to dad for 52 years while John had been married to his wife for 48 years. They are both from that generation where it wasn’t really acceptable to live together with out being married. So when mom was 76 she remarried so the two of them could blend their incomes and have a bit more financial security. This generational distinction is important. It is this generation of seniors that are being hit the hardest by budget and program cuts. I am seeing this everyday as I assist my mother with many day to day issues. After almost ten years of a happy marriage John’s dementia got to the point where my mother just didn’t have the energy anymore to be a caregiver. 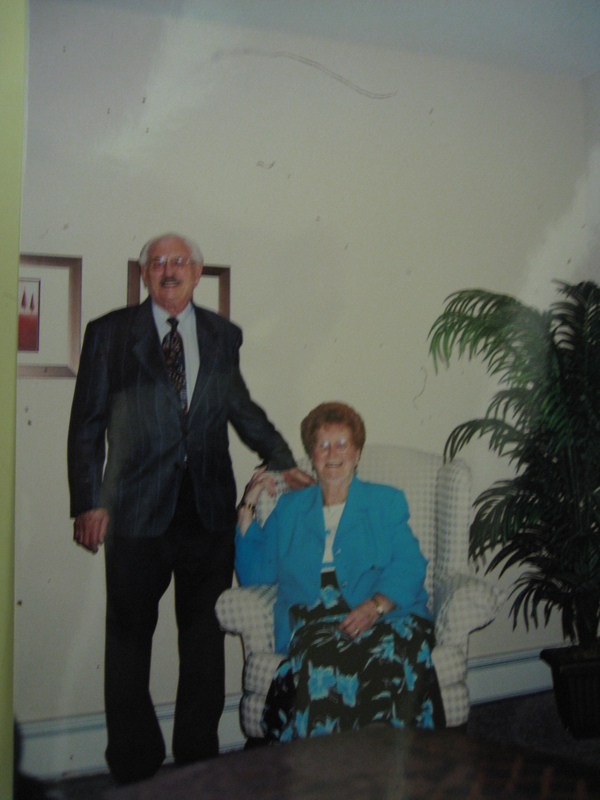 John is now in a separate care centre and mom remains in her assisted living residence. She enjoys it there, has a lot of friends of the same generation and has a system watching over her shoulder in the event she needs assistance. My role here to make sure that happens and that is where the generational shift occurs. My mother is from the generation that grew up during the depression, came of age during World War 2 and gave rise to the baby-boomer generation. In other words, me, my siblings and my peers, the new generation of seniors. My mother’s generation grew up being thankful for the things they had, an affect created by the Great Depression. World War 2 brought prosperity to Canada including a greater understanding of the need for democracy and freedoms. It was a generation that attributed success to a democratic system of government. It was a generation that didn’t question. After all compared to the depression and the war their government was providing huge successes. And this generation birthed the baby boomers. The baby-boomers a generation of make love not war, a generation of social activist, anti-war protestors, a generation of people not afraid to speak out. The generation our parents belonged to believed in hard work as a means to improve their children’s’ lot in life. They had no guarantees except what they could provide for their children, us the baby-boomers generation. My parents generation didn’t even have a guaranteed retirement. The Canadian Pension Plan never came into being until 1965 under the government of Liberal leader Lester B. Pearson. That was the same year the age of retirement dropped from 70 to 65. Our parents plan for retirement was to put their faith in the extended family concept and hope their kids would be there at the end. The baby-boomer generation had different plans. They were busy marching, protesting, going to university (most of our parents were lucky to have grade 10) or heading into a trade directly from high school. We were scattering around the country and moving away from the extended family concept. We were becoming consumers who wanted charge cards, store bough bread, canned and/or fast foods, TV’s, two cars, and on and on. Things our parents had never even dreamed of. After all they were busy trying to provide a better life for the baby-boomers. Now my mother lives in an assisted living centre worrying about when her money will run out. She sits back while programs and services are scaled back without so much as a word. After all the government is there to help, right? And while the government is “taking care of things” the rate of homeless seniors is on the rise in Vancouver. In Toronto the number of homeless seniors has doubled over a four year period. In Kelowna the amount of seniors using food banks has risen over 20% while the Canadian Revenue Agency removes the charitable tax status of a seniors food bank. But this is a generation that won’t speak out. When I called the MP, Ron Cannan, to discuss a variety of matters in the Kelowna area all I received was scripted rhetoric and then given the brush off. Yesterday while visiting with my mother we had coffee with friends of hers. A couple in their late 80’s living solely on their CPP and OAS. They live in fear of one of them passing away and leaving the other destitute. And what is Ron Cannan and our government doing, closing Vet Centres while manipulating the electoral process. The level of assurances this generation has is non-existence and it’s now time for the baby-boomers to drop that self centred approach and step forward. We are now our parents caregivers and that is as disruptive to their esteem as their dependence on a system that doesn’t exist anymore. They won’t fight it because that’s not who they are. It is unrealistic to expect that generation to change after 80 years of conditioning and believe. It’s time for the baby-boomers to become the care givers our parents hope for. It’s time to stand up for your parents the way they spend their life standing up for us. Personally I am tired of watching the services for seniors stripped away. Government policy like the Fair Elections Act is just another erosion of the safety net that was suppose to be there for our parents. How do you vote when you live on the street and no longer have a fixed address. It’s time to stand up in defence of our parents and speak out against this new type of democratic reform that is stripping away the services our parents invested their life in. They can’t, WE MUST. This entry was posted in Personal Life, Politics and tagged assisted living centres, CPP, democratic erosion, extended families, homeless seniors, Kelowna food bank, Ron Cannan, Terry Wiens, veterans affairs. Bookmark the permalink. It’s time to do more than talk. I’ve set up an event on Facebook. April 30th is Stephen Harper’s birthday and I want to give him a party he will never forget,. We need to stand up and start yelling – not on a single issue, not in small groups, and not just in Ottawa but coast to coast to coast. Until we show just how many of us there are and just how angry we are, they just won’t get it.